An artist book with mutli-coloured abstract illustration of gardens on the cover in a bespoke box. This work is study on the influences, ideas and creativity revealed in gardens, both ancient and nearer to our time. The texts include writings form Ancient Egypt, Persia, Mughal India and Renaissance Italy which were researched together with visits to each garden. The book is printed by hand-set letterpress accompanied by etchings, lino cuts, hand colouring, photographs and collage. The binding is of painted calfskin and inlaid and onlaid goatskin, finished with black copper leaves. 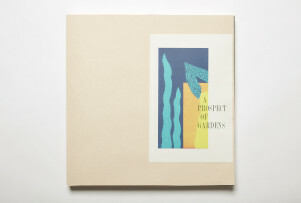 Purchase of 'A Prospect of Gardens' (2015) supported by a donation from an anonymous donor. 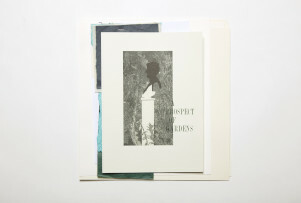 A Prospect of Gardens, Susan Allix, 2015. Crafts Council Collection: 2017.2. Photo: Stokes Photo Ltd.
A Prospect of the Gardens, Susan Allix, 2016. Crafts Council Collection: 2017.3. Photo: Stokes Photo Ltd. This book is probably the largest and most complex in terms of content that I have made; it is certainly the heaviest, which is a lesson in itself. As always when a work is done, it unsettles and suggests a different direction to take. It began as an idea when I read about the very tall lettuces of Ancient Egypt - something that might be verified. It grew to include both chance encounters with gardens and aspects that had interest me from long ago. In the end I had to choose which voices to record, which colours, shapes and moments to describe, with the materials I use, this meandering relationship we have with gardens.